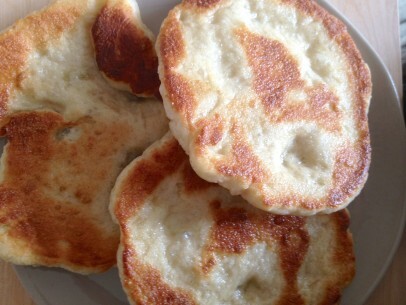 Ladopsomo is simply fried bread and a more delicious result of a handful of plain ingredients there never will be. Most countries have a version of fried bread or fried dough. In Greece, it can be served as a side to savory or sweet dishes or stand on its own as the perfect snack. Ladopsomo is light, fluffy and not at all greasy. 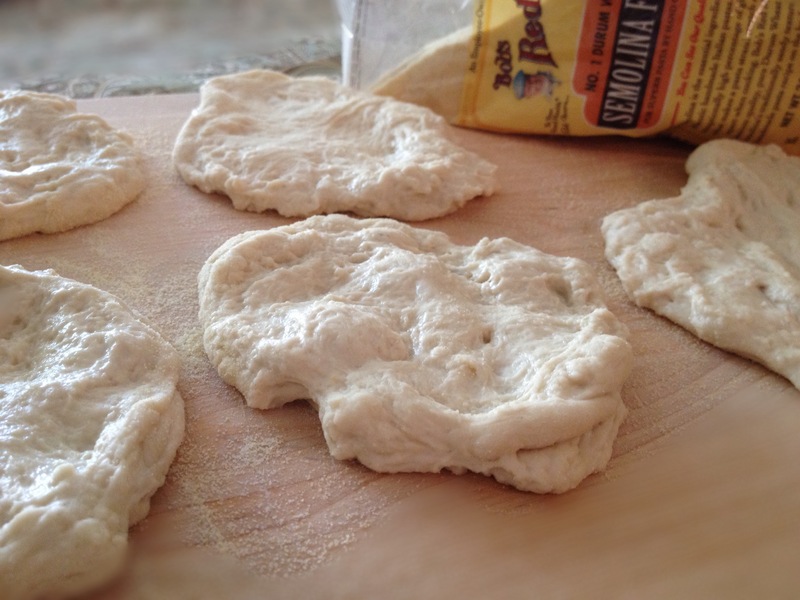 I use the same dough recipe as for Lagana Bread or you can use a good quality store bought pizza or bread dough with fine results if you’re pressed for time. Simply pinch off fist size pieces of dough, stretch them gently out into a circle and let them rise for 30 minutes or so. I lay them out on a board or sheet pan dusted with semolina flour. Semolina is my go-to duster when working with bread dough. It doesn’t add any additional flour and keeps rising dough from sticking to surfaces. In a low sided pan, simply fry dough circles in about 1 tbsp of olive oil on medium/low heat until nicely brown on each side. Takes only about 2 minutes per side but keep an eye on it the first time so you don’t burn. I often use an egg pan for this job myself. A quick trick – between batches, I move the pan off the heat (only for less than a minute or so) and this helps the pan not be become too hot and scorch the oil. Burnt oil leaves a terrible acrid taste behind and certainly is not what you want on your ladopsomo. Play with your stovetop temperature until you get that nice golden brown. The dough will puff right up as it cooks with lots of great nooks and crannies perfect for filling with sweet or savory toppings. Flip over with a fork and drain on paper towel for a few seconds when done. Because of the very little oil in the pan, these are not greasy at all! Serve warm or at room temperature. Sprinkle with a bit of sugar and enjoy sweet or use as a delicious plate under mushroom stifado or braised okra or as a side with vegetable stew or Greek green beans. Honestly, the possibilities are endless! If you’re going with store bought dough, skip to the end! Combine yeast, sugar and water. Set aside for 10 minutes for the yeast to activate of proof. Small bubbles will form on the surface when the yeast is activated. If no bubbles form after 10 minutes, your yeast may be too old. Do not use unless the yeast has proofed. Combine flour and salt and add yeast/water once it has proofed. Mix well until you have a sticky dough. Turn dough out onto a floured surface and knead for approximately 10 minutes until the dough is smooth and holds together in a ball. Place ball of dough in a large bowl that has been very lightly greased with olive oil (or dusted with flour) and cover with clean dish towel or plastic wrap and leave in a warm spot in your kitchen to rise. This should take about an hour to and hour and a half. The dough will double in size. Gently poke your finger into the dough to test if its fully risen. If the dough bounces back immediately, your dough needs more time to rise. The dough should rise just halfway after you remove your finger. 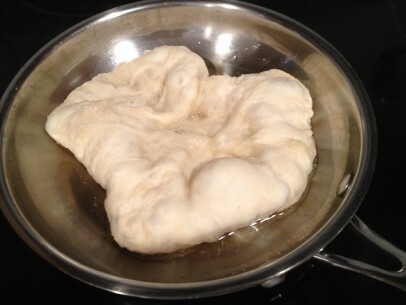 In the bowl, knead the risen dough a few times to deflate it and then turn out. Pinch off 6-8 fist sized balls of dough. Gently stretch and pat your dough into a circles and fry in 1 tbsp of olive oil on low/med heat for about 2 minutes per side until golden brown. Drain for a few seconds on paper towel. Serve warm or room temperature. Hungry for more? Find 25 more of your favorite authentic, traditional dishes in The Greek Vegan Cookbook (PDF) – 33 pages of beautiful, full color, detailed, interactive recipes order your copy today! I grew up with it and so did my children and grandchildren! We love it any way possible! But we call it …Tiganopsomo!!!!!!! I shared in my FB and got some likes and comments! Thank you for posting this delicious recipe. Made this for my children for an afternoon snack and it was wonderful. There is a great tradition for different kind of zymes and breads and rusks etc in Greece. This is a very easy but absolutely amazing version of quick bread! 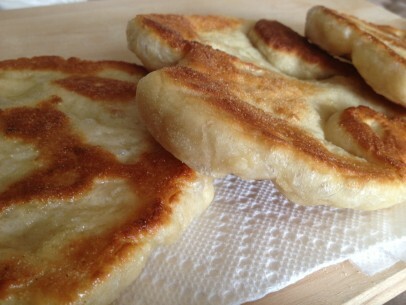 I love this fried bread. I’ve had it with hummus on top. I have eaten it with green beans. I have also eaten it with roasted zucchini, onions, and tomatoes. It is so yummy, and it really helps to round out a vegan meal.